Sometimes I wish that WordPress had adopted Vue.js instead of React in their editor. I wasn’t a part of the discussion when they were choosing a framework, so I don’t know all the details. So I started to wonder, can I shim the editor and put Vue in WordPress? The answer is yes. 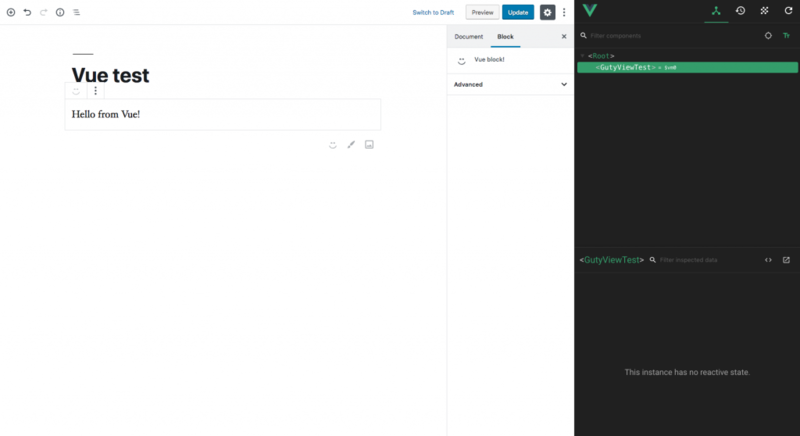 Yes, you can put vue in WordPress if you’re willing to put a little effort into it. Thanks to a package called vuera, this is actually very easy to achieve. It may not be something you’d actually want to do on a production site… but who knows? We’re going to create a very stripped down build for a plugin here using webpack. We’re going to build a js file and register the block in php. npm init -y // init, and don't as me questions! This will get us up and running if we create a webpack.config.js file and a .babelrc file. ➡ Make sure you install the plugin in the admin, and then you should see the script running in your editor! As usual, I just did a console log to make sure the script was there. Last thing we should do is create the simplest registerBlockScript so there’s actually a block to add Vue to! Cool, so we have a test block that shows in our editor. Let’s include some vue. Firstly, we need to install the plugin that will allow us to call Vue from a React component. We also need to include some loaders so that webpack knows how to include Vue in the project… also, we need Vue. const VueLoaderPlugin = require('vue-loader/lib/plugin') //new! Cool. I recommend running ‘webpack –watch’ from now on so webpack will just stay running and watch your files. Now to actually create a vue-in-react component. Back in the /src folder let’s create two new things. First, the actual vue component. I’m naming it ‘guty-vue-test.vue’. Next, we need to create the react component that loads this vue component. This is the one we’ll actually import into index.js and use. this is where the magic happens. Vuera notices the import and somehow connects the react reactivity to the vue reactivity. Yay! import Wrapper from './wrapper'; //new! Now we can see how to update attributes. So, why haven’t we talked about the save method in the guty block? Well, to be honest, I tried to render out a vue component, but it’s not working. I have a lot to learn about the save function, because I’ve run into this issue where I have a component that I think is stateless and it doesn’t render on save. Does anyone have a good explanation for why this doesn’t work? I’ve shown that we can use vue in the editor to create an editing experience. I have yet to show that you can use Vue to render strings… hopefully I can figure that out. Why would I want to put vue in WordPress? Why would I not? Vue, in my opinion, is just faster and more robust and more understandable and prettier than React. I can code React just fine, and it’s not bad- don’t get me wrong. But if you prefer building interfaces with Vue, we have options. I am seeing many people talk about use cases where a company wanted to use Vue components and didn’t want to rewrite them in React or vice versa. Another cool thing that goes along with this is that you can hook up Vuex and other cool global Vue things- router, plugins, etc. Maybe you want to create a complex, multipage vue block? It could happen. But, it’s just ugly to write something in two frameworks… and I had to load two framework dependencies (and some more plugins) to achieve this. I also had to create a wrapper because of the way Gutenberg works. This is not something I would suggest right now. When I told some of my colleagues this, they recoiled at the thought of a framework in a framework. I feel the same when people mention using jQuery in React or Vue.